Each week we receive several emails from people who have been scammed by either a Microsoft support scam or another support scam. We are reprising this article because it’s important that you know what these scams look like, how they work, and how they try to trick you. If you read this article and you look at the images of some of these scams, then you’ll be better prepared and you won’t fall prey to these criminals. We are trying to keep you safe – and keep you from wasting your money on these kinds of scams. In a hurry? If you want to skip the why and get to how to get rid of these scams popups, click here. We hope you’ll read this entire article so you’ll recognize these scams on sight. If you know what’s coming, you can be prepared. And if you’re prepared you won’t be scared and panic. In this article we’re going to explain how these scams work, how to get rid of them if you see them, and show you some examples so you will recognize them when you see them. And if you spend enough time on the Web, you will see one of these scams. 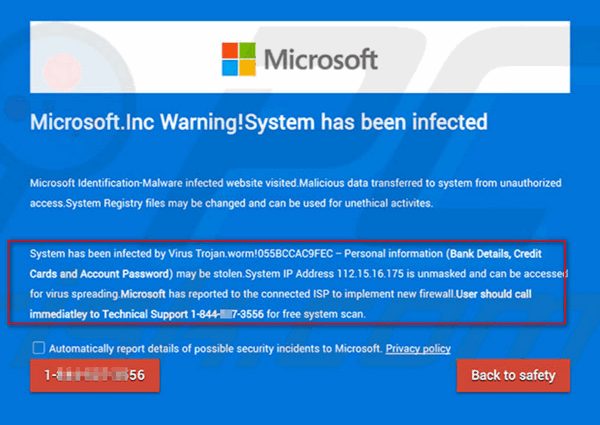 Whether it’s a Microsoft support scam or any tech support scam, you need to know these kinds of scams abound- and sooner or later, you’re probably going to run in to one. 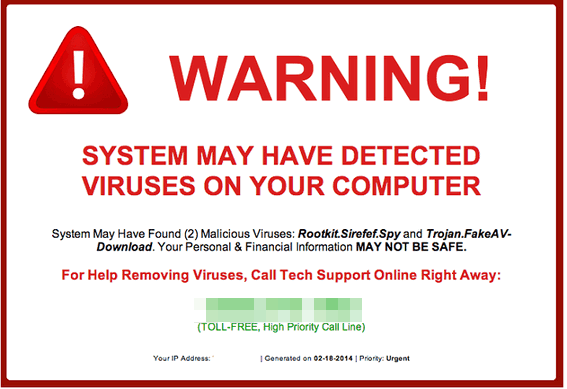 We receive several emails each week from folks who encounter these kinds of scams and are convinced their security software has let them down now they’re infected. But it’s not true. 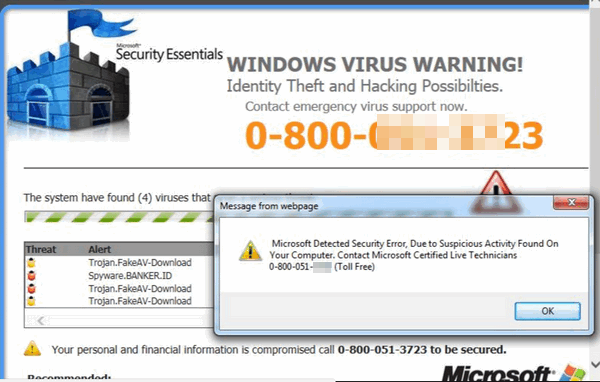 Most of these support scams are carefully crafted advertisements cunningly created to make them appear to be warnings coming from your own computer or from Microsoft. 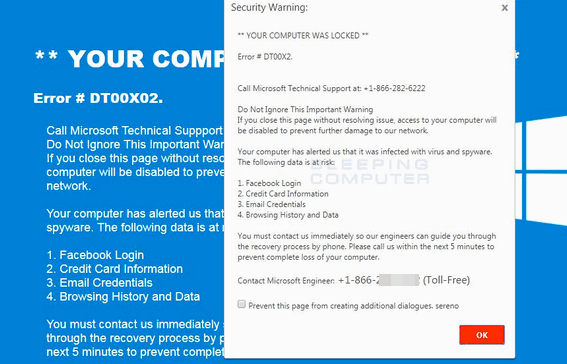 Because it seems these tech support scams are back in full vigor, we hope you’ll read this article, look that the images here, so that you’ll know, right away, when you’ve encountered one of these tech support scams. 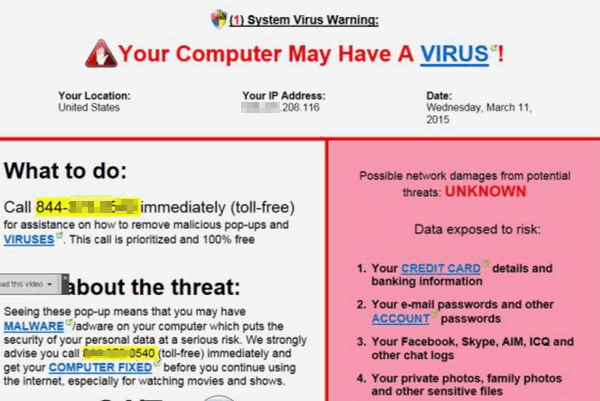 Remember: The actual warning you see may look a bit different [the most popular tech scam going around at the time of this writing what we call the “You-have-been-infected-with-the-xxxx-Virus” scam. 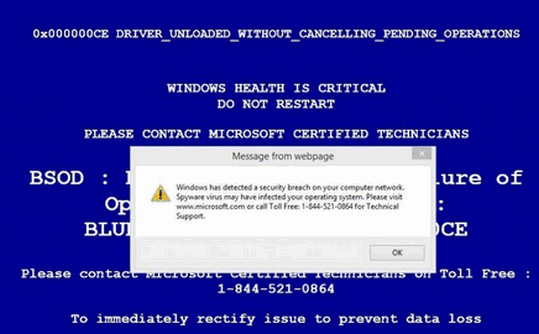 In the past, many people who have run into the Tech Support or Microsoft Tech Support Scam have been contacted by scammers and warned by telephone that their computers are infected or compromised. 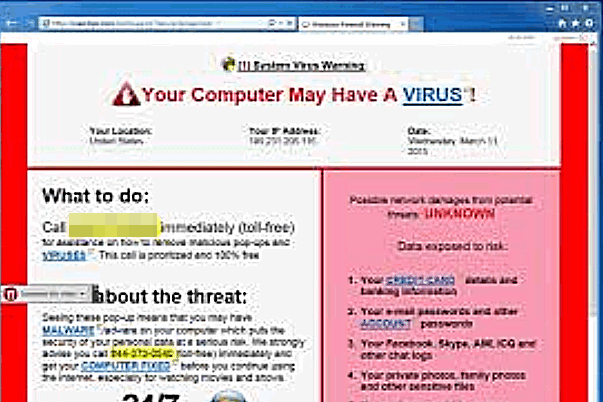 But it seems now, the fake “your computer is infected with **whatever the name of the non existent virus/Trojan is ** or the ** your computer has been compromised and your personal information is at risk** – or the even scarier **If you don’t click this – all the data on your hard drive will be erased* popups that appear, seemingly out of nowhere, when browsing the web. Many appear to be coming from your own computer. All of these fake “Your computer is infected” or “Your computer is compromised” or other dire warnings that pop up out of nowhere, are popups ads. They’re not viruses, or Trojans or malware. They’re ads that try to trick you into into calling a phone number for support. They’re scams. 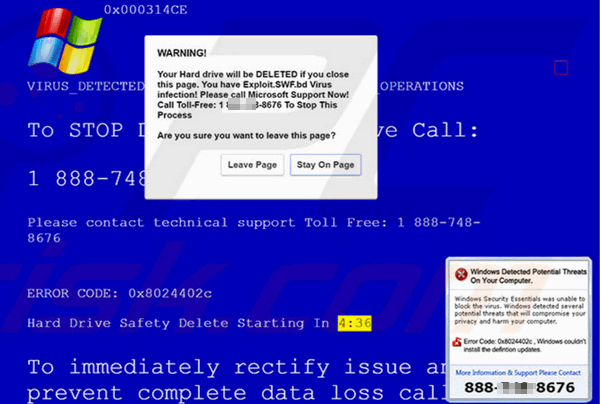 For this article we’ve collected some of these fake warning popups, and we posted them at the bottom of this article. 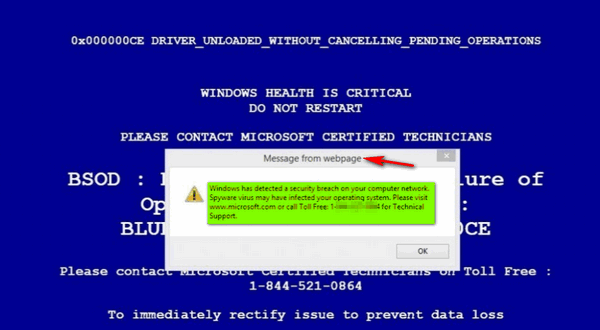 Keep in mind, these are just a very few of the many variations of scam popups out there… there are hundreds of them. Some have different wording, slightly different colors, some look more realistic than others, but they all have the same mission: To get you to call a number so they “fix” the non-existent virus infections, computer problems or errors. People who do call, will be told that the “technician” needs to connect to their PC so they can run special scans. 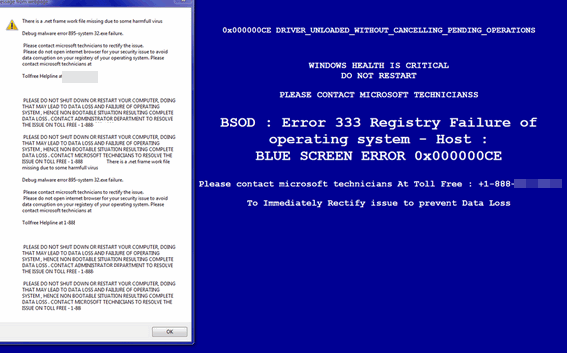 The scans, of course, are fake and always turn up dozens, sometimes hundreds of infections, errors and problems. Not to worry, they’ll tell the victim… they all can be fixed… for a price. We have heard from people who have been bilked out of hundreds of dollars. One person who wrote us recently, lost $1000 on this kind of scam. 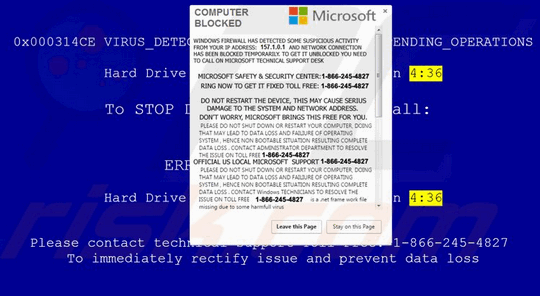 There’s a version of the support scam or Microsoft Tech Support Popup Scam, where the victim calls a phone number and the technician runs the fake scan or scans, then tells them what’s wrong (all fake) then tells them they need to buy a couple hundred dollars worth software programs to clean, fix and protect their computer and their privacy. Of course, they’ll want your credit card number – would you actually give your credit card number to a criminal? No, of course not. But because people think they’re dealing with Microsoft, they do give out their credit card numbers and lose hundreds of dollars to scammers. Please do not fall for these kinds of scams. If you should see a warning that your hard drive will be wiped if you close your browser, that is not true. 1.) Use CTRL + F4 to close the offending browser tab (Press the CTRL key and the F4 key on the top row of your keyboard). 2.) Press ALT + F4 to close all open browser tabs. 3.) Open Task Manager by pressing the CTRL+SHIFT+ESC keys. In Task Manager, click on the “Processes” tab at the top. In the list of processes, right-click on each instance of your browser you see running and choose “end task”. Note: Google Chrome usually shows a process for every tab open and every Chrome extension running. You’ll need close as many of these as necessary until you see the browser window with the scam in it close. Browser processes for the most popular browsers show as chrome.exe, firefox.exe, iexplore.exe (for Internet Explorer) and Microsoft Edge. 4.) Press and hold down the Windows key and tap the R key. Type SHUTDOWN /R in the Run box and press Enter. This will restart your computer and close all open programs. Make sure when you restart your browser or your computer, when your browser asks if you want to restore the tabs that were open, you want to decline – otherwise, there’s a good chance you’ll find yourself right back where you started with the scam popup. BE PREPARED – NOT SCARED. 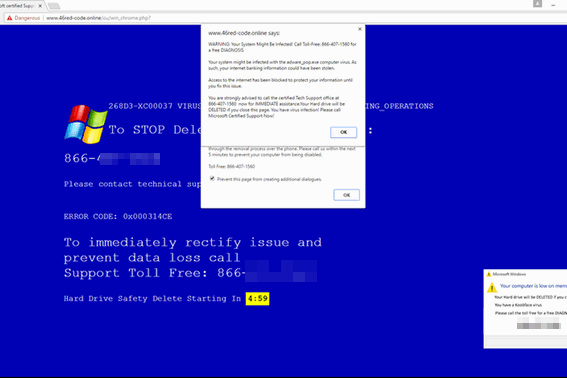 As promised, here are some screen shots of a few of these scam popups. Remember: These are only a few of the hundreds of different scam popups out there – but most tech support scams use the same basic techniques to get you to all a phone number for help. All the references to Microsoft are just to lure you into to trusting the scammer. 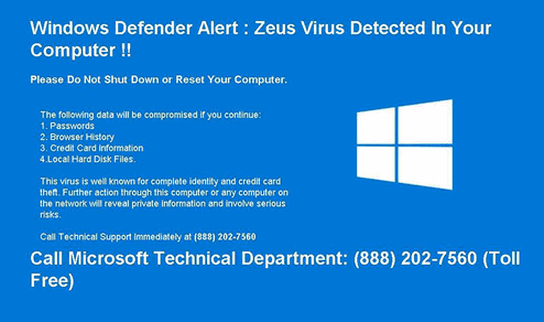 Microsoft has nothing to do with any of these scams. 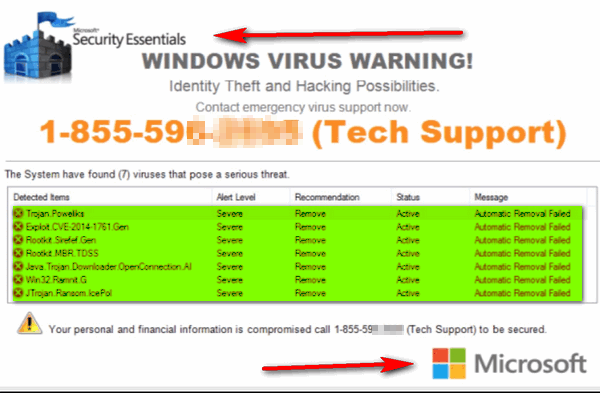 SOME SAMPLES OF WHAT THESE KINDS OF SCAMS LOOK LIKE – THEY MAY LOOK REAL BUT THEY ARE ALL SCAM ADVERTISEMENTS FOR FAKE TECH SUPPORT OR MICROSOFT SUPPORT SCAMS. THEY MAY APPEAR TO BE COMING FROM YOUR OWN COMPUTER – THEY ARE NOT. THEY ARE COMING FROM THE WEB. All of images above looks authentic … very real. Their messages vary; most are dire. But… they are ALL SCAMS, folks. Here are some more images and they are all scams too. Oh my! My data is going to be lost or corrupted if I don’t call that number! Woe is me. NO! Not woe is me. It’s just a tech support scam. Above: Are you getting the idea that there are an endless number of scams out there trying to trick you and steal your money? There are. We’re here to expose these crooks. Don’t let them fool you. Just one more. Take a look at the image below. This scam makes it looks like you computer was scanned and lots of malware and bad stuff was found lurking on your PC. Looks like you better call and get it off or your PC will explode and your privacy will go up in a cloud of smoke (no pun intended). Notice the Microsoft logo at the bottom and the Microsoft Security Essentials logo at the top. No one using Windows 10 could possibly be using Microsoft Security Essentials, so you should NEVER be fooled by this one. 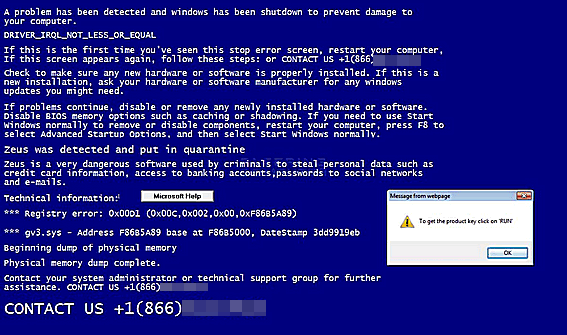 And if you are using Windows 7 and still using Microsoft Security Essentials, you should be using something better. And no matter what, you should recognize this as a scam, if for no other reason than the theatrical way they try to get you to call “Tech Support”. I’ve had these but can’t remember if Microsoft was mentioned and I just restart the computer. I did get a phone call from ” Microsoft” saying that something I had on the computer expired and wanted me to call. It came up on my phone ID. I just ignored and deleted. TY for warning us TC. They can be scary sometimes, especially when a voice is telling you not to try to delete, etc. And when you do try, you can’t by simply clicking on the red X. That is when I hit the window key and restart. This is such a long email, I started not to read it. I mean, I’ve never fallen for one of these scams (thanks to you), but I changed my mind and read it. Now, I’m glad I did. Some of these ‘warnings’ sound so bad that I might have fallen for them. I needed the reminder. Thank you. I have had a couple of these scams but at least I didn’t fall for them. Thanks for all this great information! Thanks for the information, I had this happen to me several years ago and they locked me out of my computer, it was a total Nightmare! What do you mean you “got locked out of your computer”? Do you mean if you power off your machine you cannot power it back on? Are you referring to Ransomware or scam ads like the article you’re commenting on refers to?